The Stevenage Pipe Band passing the Cromwell Hotel during the 1963 Carnival. The Band used to practice in the yard behind the Unicorn Public House (now the Bombay Restaurant) in the High Street, and could, on summer evenings be heard from Fairview Road. The Pipe Band always led the Remembrance Day Parades in the 1960s. This page was added on 03/11/2011. 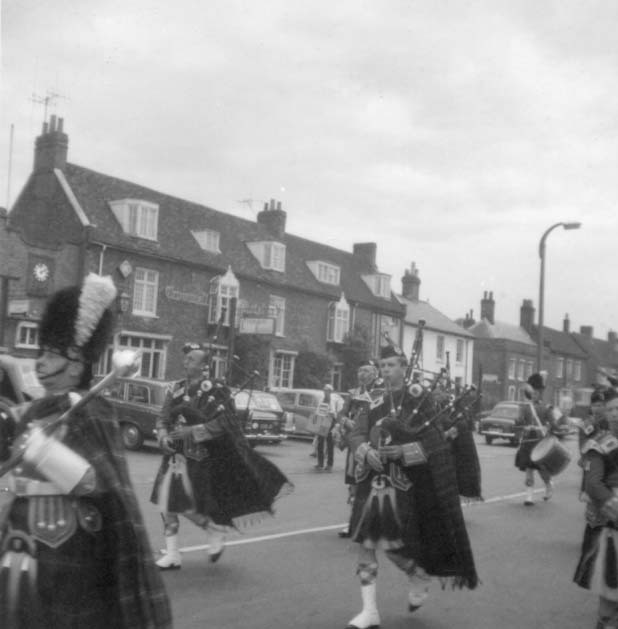 Lapland Barclay School, the Clip starts With the Stevenage pipeband in 1968, walking up the high street. Hope you see what you want. I am looking for pics of myself Angela Batchelor playing drum and my brother peter who used to play the base drum in the 60s. If anyone knows where I could maybe find some would they email me please. Thank you.